Looking for a new and colorfully unique way to prepare lasagne alla bolognese? 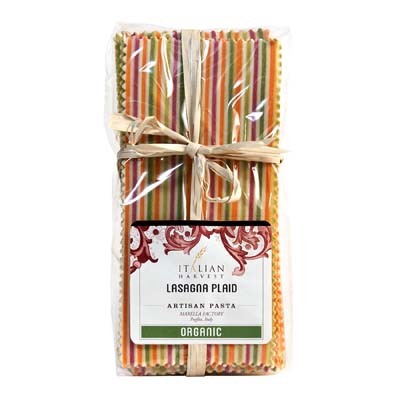 Grab a pack of organic artisan Lasagna Plaid by Marella then. With each sheet bearing an array of beautiful bright colors, your dish will be the veritable talk of the town. Not only will it be a thing of awe to the palate but also a wonderful feast for the eyes. Marella Pasta uses only 100% Italian grains. Moreover, all their pasta are handcrafted and are slowly and painstakingly dried at only a temperature of 37 to 38 degrees! A recipient of the 2013 Silver Sofi Award for “Outstanding Product Line”, you will find that Organic Marella Pasta certainly deserves the recognition.